Here’s a list of Philhealth-accredited eye clinics in Laguna for cataract surgery. Aspac Eye Laser and SurgiCenter Inc.
Calamba Vision Enhancement Center Inc.
Fortmed Medical Clinics-Sta. Rosa Inc.
360 M.H. Del Pilar St.
Wellcare Clinic and Laboratory Inc.
How much is Philhealth coverage for cataract surgery? Philhealth’s coverage for cataract surgery for one eye is 16,000 pesos. A member can avail of cataract surgery for both eyes, 16,000 pesos for each eye, and a total of 32,000 pesos for both eyes. The first and second surgery can be scheduled a few weeks or several weeks apart. The coverage may include the cost of the intraocular lens (IOL) that will be attached to replace the lens that was also removed when the cataract was removed. 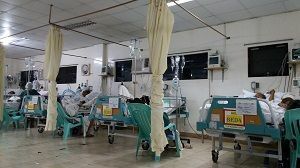 What are possible other costs that are not covered by Philhealth?